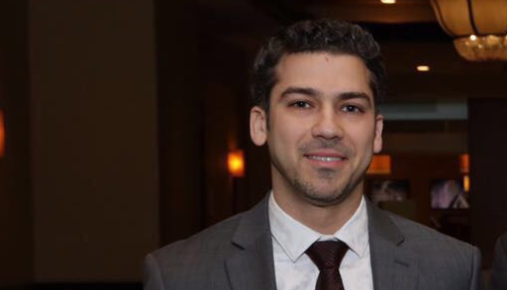 Abdulrazak Alchakaki, M.D., a fellow of the Pulmonary and Critical Care Medicine program at the Wayne State University School of Medicine, won the 2018 Innovations in Fellowship Education Award from the American Thoracic Society for a novel curriculum for medical residents that mixes both didactic and hands-on education methods related to patients on mechanical ventilation. The society named "A Novel Simulation-Based Mastery Curriculum for Mechanical Ventilation (MV) in Pulmonary & Critical Care Training Programs" the top submitted abstract of the competition, as selected by the 2018 Innovations in Fellowship Education Working group. In the award letter to WSU, the working group noted, "It was evident through your abstract that your program has proven exceptional over the past year and has shown innovation and educational excellence. The ATS Training Community values the importance of a solid and reputable fellowship training program and we applaud you for this high achievement." MV helps patients breathe when they are recovering from surgery or critical illness, or cannot breathe on their own, and helps raise oxygen levels when needed. The curriculum uses education methods such as didactics, high-fidelity simulation and clinical rounds. Dr. Alchakaki will receive the award at the Section on Medical Education Meeting, part of the society's concurrent international meeting, May 22 in San Diego. "I am very delighted to be recognized for the work we have all done as a team at Wayne State," he said said. "This recognition will certainly give me a push to take the project to the next level, where we can standardize mechanical ventilation education and evaluation aiming to improving patient outcomes in intensive care units." The pulmonary critical care program, co-sponsored by the Veterans Affairs Medical Center, has been recognized by the American Thoracic Society as a top program in medical education in the United States. The abstract also won the Association of Pulmonary and Critical Care Medicine Program Directors' Abstract Award for Medical Education Research last month. Dr. Alchakaki is the first Medical Education fellow in the School of Medicine's Pulmonary and Critical Care Education track, a unique position developed by his mentor, Abdulghani Sankari, M.D., Ph.D., an associate professor of Internal Medicine who directs the PCCM program, in conjunction with leaders in health care delivery at the Veterans Affairs Medical Center, including Maryjean Schenk, M.D., M.P.H., and Department of Internal Medicine Chair and Professor Safwan Badr, M.D. Dr. Alchakaki is expected to graduate in June. He completed his residency at the Detroit Medical Center's Sinai Grace Hospital after earning his medical degree from Jordan University of Science and Technology. The training team includes a program director, medical education fellow, respiratory therapist and simulation coordinator. Dr. Alchakaki is grateful for the support he has from WSU and the Detroit Medical Center, as well as the VA lab, including from his mentor and the entire Pulmonary Critical Care Medicine team.